No, but by calling and scheduling an appointment, we can be sure to minimize your wait time. To first begin the claims process, you will need to contact your insurance company and report the accident, mentioning that Dabler Auto Body will do the repairs. Contact us directly and our customer service representatives will guide you through the process. We are a direct repair facility with most insurance companies. This means we can make the process simple and convenient for you. Are there any precautions or tips that I should follow on a newly painted vehicle? – Bird droppings have a high acid content and will damage a freshly painted surface. – Also, tree sap can mar or spot a freshly painted surface. How will I know when my car’s repairs are finished? 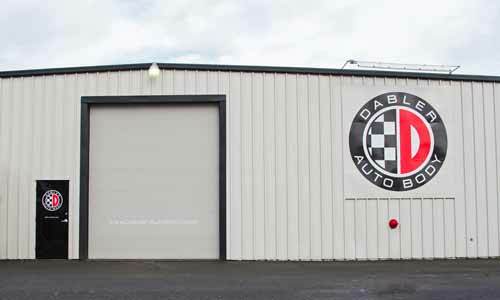 Dabler Auto Body will contact you via your method of choice when your vehicle is ready for pickup. We have a fleet of rental cars available here at the shop. Also check with your agent or insurance company to see how much of the rental is covered; some policies pay the full amount, some will only pay a percentage. If the claim is a liability claim (the accident was not your fault), the full amount will be covered. The deductible will be due at the time that you pick up your vehicle from our shop. You will pay Dabler Auto Body your deductible costs. My insurance says that my vehicle is a total loss, or has been ‘totaled’, what does this mean? This means that the costs to repair the vehicle to the state before the accident is more than the actual value (ACV) of the car before the accident occurred. If you feel the ACV offered by the insurance company is too low, then you are obligated to prove this either through documented receipts of vehicle enhancement or written statements by qualified experts to determine the proper value. Who determines the ACV of my vehicle, and is it negotiable? The insurance company assigns an appraiser to value the car based on what the vehicle’s value would have been prior to the accident. Sometimes the appraiser will consult the repair shop on determining values. What happens to my vehicle after it has been deemed a total loss? You have the right to retain ownership of the vehicle, but the amount of the settlement may be reduced by the salvage value. If y0u do not request to retain ownership, then the insurance company will sell it to highest bidder. Your vehicle’s repairs will be backed by a LIFETIME warranty on parts and labor.